From left to right: Stephen Allen as Nomax, Lorenzo Rush Jr. as Big Moe, A.D. Weaver as Little Moe, James Earl Jones II as Eat Moe, Eric Andrews Lewis as No Moe, and Kelvin Roston Jr. as Four-Eyed Moe. 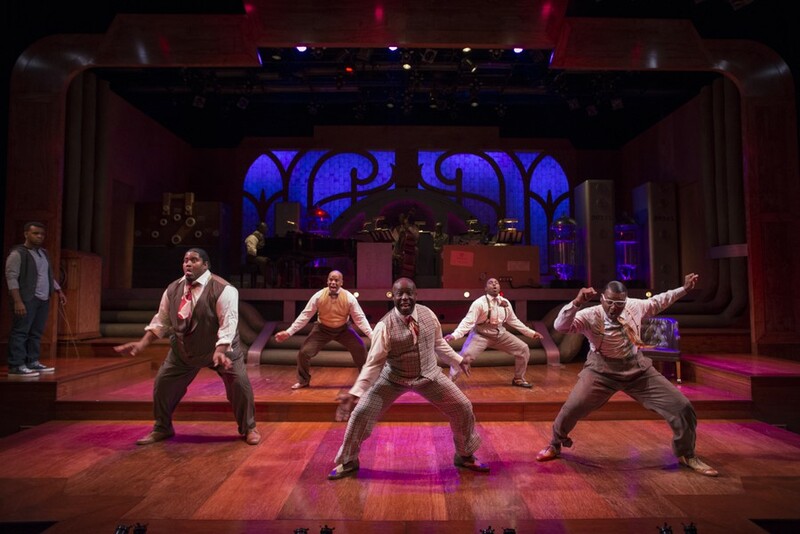 The Court Theatre season opener, Five Guys Named Moe, is a delightful tribute to the music and legacy of jazz musician Louis Jordan. Although the musical begins with a downcast Nomax (Stephen “Blu” Allen) singing “Early in the Morning,” the bluesy tune sets no precedent for the humor and liveliness that imbues the rest of the musical. Moments after the song ends, five guys—Eat Moe, No Moe, Little Moe, Four-Eyed Moe, and Big Moe—emerge, literally headfirst, from Nomax’s radio to offer him relationship advice through song and dance. As director Ron OJ Parson noted, this show is typically produced in 1,300-seat theaters. Yet the intimate setting of the Court does not diminish the actors’ showmanship, which shines in both laugh-out-loud moments (Four-Eyed Moe wearing a chicken headdress during his falsetto performance of “Ain’t Nobody Here But Us Chickens”) and somber ballads (Eat Moe’s rendition of “Don’t Let the Sun Catch You Crying”). Each song in the musical is a show in itself, spectacularly choreographed, and accompanied by live music that resonates throughout the theater. There are certain expectations that come with a musical of Louis Jordan’s greatest hits: We know, before even taking our seats, that we’ll hear hits such as “Is You Is or Is You Ain’t My Baby” and “Caldonia.” Yet from No Moe’s backflip to the lyrics falling from the sky, Five Guys Named Moe is chock-full of surprises. Even the classic “Is You Is Or Is You Ain’t My Baby” is lovingly reinterpreted in a bluesy tone. Just as the five men startle Nomax by inviting themselves into his personal life, they surprise the audience by inviting us into the bizarre musical world they have invented. They address male members of the audience from the beginning, singing “Beware, Brother, Beware.” Later, they invite two women onstage, offering an “apology for all the chauvinistic songs” in the play, and serenade them with “Look Out, Sister Look Out.” We join the chorus for “Caldonia,” participating in a call-and-response with the Moes. And in the most memorable segment of the show, concluding a winning first half, the five guys have the audience singing gibberish (“Push Ka Pee Shee Pie”) and walking out the door in a conga line. Five Guys Named Moe will run until October 15. Court Theatre’s UChicago Student Night is October 6, 8 p.m. Advance and rush student tickets cost $20 and $10, respectively, and free Jimmy John’s will follow the performance.